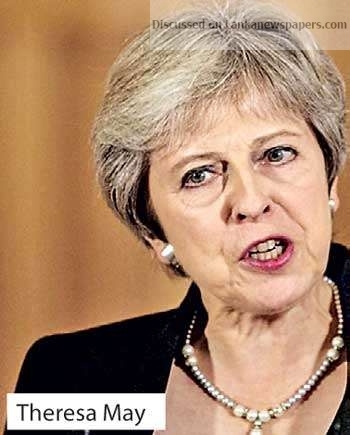 LONDON (AFP) – Prime Minister Theresa May on Thursday fended off heavy opposition in parliament after Britain and the EU agreed on the outlines of post-Brexit ties as part of a draft deal due to be signed off by EU leaders. After briefing her cabinet in a hastily-arranged teleconference call, May addressed the House of Commons, saying the agreement was the “best possible deal”. EU Council President Donald Tusk said the 26-page declaration covering trade, security, the environment and other issues was agreed “in principle” and would be sent to the other 27 member states for approval. The pound leapt by about one percent against the dollar and also firmed against the euro on the news, which allayed fears Britain could leave the European Union next March with no new arrangements in place. But the deal does not address the thorny issues of fishing rights and Gibraltar, which have raised concerns in EU capitals. Former foreign minister Boris Johnson, who is seen as a potential leadership rival, said the draft deal “makes a complete nonsense of Brexit”. She will return today on the eve of a special summit where all 28 EU leaders are expected to sign off on the overall Brexit package. First, the texts must be cleared by a meeting of top EU diplomats — the summit’s so-called “sherpas” yesterday. “The negotiations are now at a critical moment, and all our efforts must be focused on working with our European partners to bring this process to a final conclusion,” May said. It includes references to Britain developing “an independent trade policy” and declares an end to free movement of citizens between Britain and the EU — two key demands of the Brexit campaign in the 2016 referendum. In the Commons, May also highlighted the possibility that the Irish border issue can be resolved through the use of technology, rather than through the controversial “backstop” customs arrangement included in the divorce deal. It says that unless alternative arrangements are made, Britain will stay in a customs union with the EU and Northern Ireland will continue to follow the bloc’s single market rules. Conservatives fear this would mean following the EU’s rules indefinitely, while Northern Ireland’s Democratic Unionist Party (DUP), which props up May’s government, also opposes it. They have already warned they could reject the deal if it leads to the province being separated from the rest of the UK. The EU has also agreed to update the divorce deal to allow a possible extension of the transition period “for up to one or two years” if needed to agree the new future relationship. “There are some issues now regarding Gibraltar with Spain, but I hope that we can keep the unity among the 27,” he said. May, who spoke to Prime Minister Sanchez about the issue on Thursday, took a firm line, however. “Gibraltar’s British sovereignty will be protected, and the future relationship we agree must work for the whole UK family,” she told MPs. But late Thursday Sanchez maintained his threat to scupper the deal. “After my conversation with Theresa May, our positions remain far away. My government will always defend the interests of Spain,” Sanchez wrote on Twitter.